Welcome to Barco Materials Handling, manufacturers of high quality pallets, skids and crates in both hardwood and softwood. We are hands on family business with more than 35 years experience. The owners oversee every aspect of production, from the logging division and multiple saw mills, through to the product getting to you; whether it’s on one of the company owned and operated fleet of trucks and trailers, or your own. New international export rules and regulations are fast approaching; why not let Barco help with your pallet exporting needs! We are certified by the Canadian government, and have on site heat-treating capabilities to meet every export requirement, anywhere in the world. Our certifications include the new International Plant Protection Convention ( IPPC ), the International Standards for Phytosanitary Measures ( ISPM #15 ), European union (EU), and non-coniferous NC-CA capabilities. Please contact philip@barco.ca, or use our online quotation form and have our experts ensure that your wooden pallets, crates and export packaging meet all the needed export criteria. For more information on our Lumber Mills, and our other Hardwood Forest products, please visit our sister company Cherry Forest Products. Barco Materials Handling is a family owned pallet and skid manufacturer, sawmill and hardwood manufacturing facility with hands-on involved ownership. Edward Baranski founded the company almost 50 years ago as a green sawmill. Today, the company is owned and managed by the second generation. We take a hands on approach to our work, always keeping in mind that customer satisfaction is paramount to the long term relationships we desire with our customers. 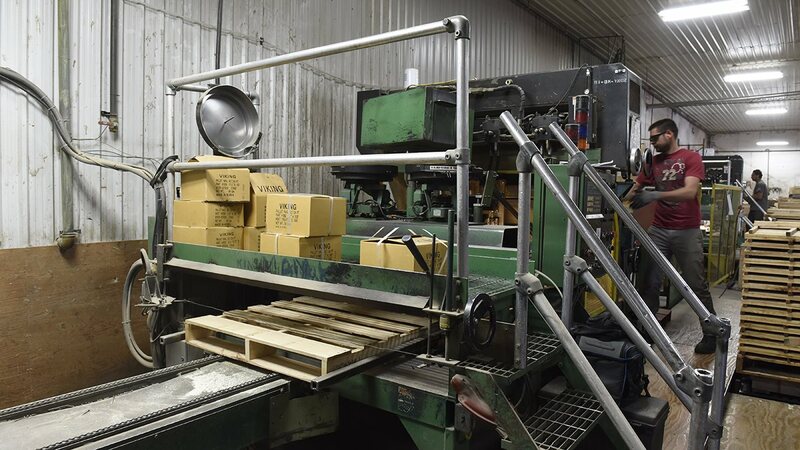 We have incorporated a number of secondary processes to build our company into both a top-notch pallet supplier, and a fully integrated Hardwood Forest products provider. Our focus is providing a high quality product for our customers through relentless attention to their needs. Whether the product is standard, or completely custom, hardwood or softwood our goal is to offer you customer specific solutions. With 130 full time employees and a facility of over 25 Acres, our growth has been possible thanks to the long-term relationships we have formed with our customers. Continuous re-investment of profit into our facility and our valued employees insure that Barco Materials Handling is a solid, intelligent choice as your partner in all your materials handling needs for the long term.